MicroStaffer's Employee Profile section acts as a central repository for all Employee credentialing information. Covering virtually every aspect of a Medical Worker's background, the Profile Tab's data flows throughout the application with it's tickler enabled functionality. The Profile tab is another example of how MicroStaffer excels at managing Mission-Critical information for your Employees (Nurses, Therapists, Aides etc.). Enter information such as Licenses, References, Job History, Incompatibilities, Education, Insurance, Skills, Tests, Training Courses, Annual Reviews, Health Screenings, Certifications, their expirations, etc. Ability to create and enable Ticklers that warn of expired dates for critical Profile information etc. 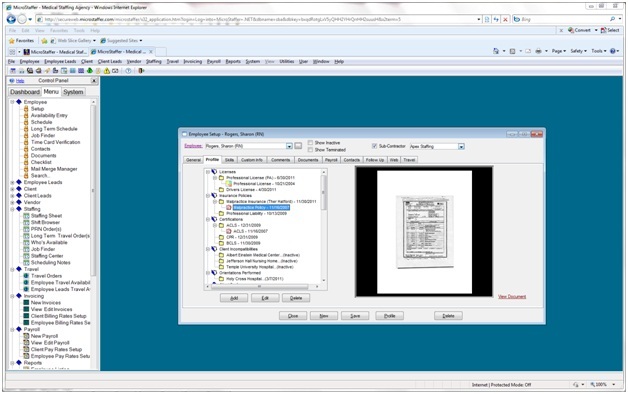 Attach critical Scanned and Imported documents to profile items such as Licenses, Physicals etc. Print or email entire set of documents together. Hide confidential items such as social secrity numbers, phone numbers etc.